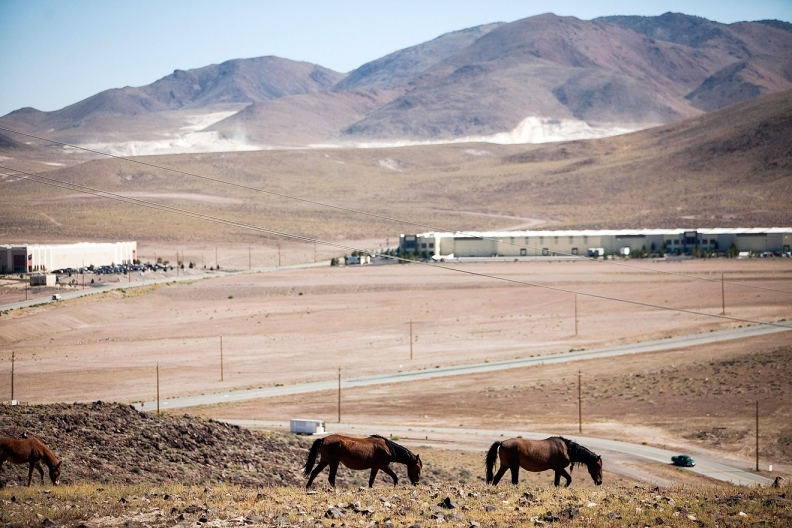 Wild horses walk near the proposed site of Tesla's factory at the Tahoe-Reno Industrial Center, in McCarran, Nev.
RENO, Nev. -- Lance Gilman bounced his white GMC truck up a hill in the high desert country east of Reno, Nev., and paused at the top to survey his property. Spread out below lay the 165-square-mile Tahoe-Reno Industrial Center, about five times the area of Manhattan. "There's a tsunami coming in," Gilman said, referring to the businesses, developers and workers he envisions occupying the place some day. The site, already partly occupied by warehouses and distribution facilities for Wal-Mart, Amazon and Federal Express, is where Elon Musk's electric car maker Tesla Motors Inc. plans a factory to make batteries, helped by more than $1 billion of incentives provided by Nevada. Out on the horizon, just past the boundaries of the industrial park, can be seen the red-tiled roofs of another of Gilman's properties: the Mustang Ranch, the first licensed brothel in Nevada. For Gilman, this dry, desolate slice of Storey County is where the old Nevada, symbolized by adult entertainment like gambling and prostitution, meets a new Nevada, where high-tech manufacturing and distribution businesses built on an immense scale may restore some of the state's fabled wealth. "In the 1800s, Storey County was the richest place on earth because of the Comstock Lode, gold and silver," said Gilman, 69, who bought the land for the industrial park with a partner for $20 million in the late 1990s. "Then it became poor. Now, maybe it will be the richest place again." That's a hope shared by Nevadans ranging from Republican Governor Brian Sandoval to the residents of nearby Reno, which exited the recession with an unemployment rate of 14 percent, well above the national peak of 10 percent during the economic downturn. The Tesla deal, negotiated by Sandoval in hope of bringing as many as 22,000 jobs to the state, includes a $5 billion factory to produce lithium ion batteries for electric cars. Tesla alone may employ 6,500 people at the new plant, 20 miles east of Reno. In the past three years, 50 companies have moved to the area, helping cut unemployment in half and restoring some life to a town that calls itself "The Biggest Little City in the World" but is littered with aging casinos and seedy bars. The land where the Tesla plant will be built is an undeveloped portion of the massive industrial park, fully zoned for a commercial center, including seven miles of its own private railroad tracks, a lake for recycled water to use in production, fiber-optic cable already laid throughout and roads planned and approved. The location is next to Interstate 80, a transcontinental highway than runs from New York to San Francisco. "Welcome to Nevada," Wayne H. Wilson, a 51-year-old out-of-work software marketer from Reno wrote in a draft of a letter to Tesla after the deal was announced. "Let's talk." As soon as the deal was announced, real estate brokers began fielding calls, and job-seekers like Wilson sent out resumes. Companies wanting to work with Tesla have been scouting locations, and community colleges and training centers are trying to figure out how to prepare unemployed residents for the new jobs. Among the training programs under consideration is one on how to work with and dispose of hazardous by-products of making the batteries, said Pieter Droog, who manages the job search and training center ProNet near the Reno airport. Wilson said he hopes that his experience working with a local mining company will make him attractive to Tesla or one of its future suppliers, in part because the electric car batteries will be made with lithium, which is mined in Nevada. Halfway across the country in Tennessee, Randy Robinette also drafted a letter to Tesla in the days after the deal was made. Robinette, who lived in Reno for eight years until 2005, specializes in human resources -- and he figures Tesla will need plenty of help with that as it moves to hire and provide benefits for 6,500 people. He's planning a trip west in the next month or two. "I'm going to check out the Reno market in terms of housing and everything, and perhaps migrate over to the California office to see if I can get an appointment," the 58-year-old said. In Washoe County, where Reno is located, public school officials held hasty meetings to plan for a possible influx of new children. Critics question the state's decision to throw so much money at Tesla, ending tax-incentive programs for the film industry that had helped the Las Vegas area, along with incentives for the insurance industry. "The process moved very quickly and we really questioned whether lawmakers had time to look at expected benefits of the deal and what the potential risks were," said Andy Matthews, president of the free market Nevada Policy Research Institute. "How are taxpayers protected if Tesla's business product does not succeed?" Started by Elon Musk, an early PayPal investor and founder of the private space travel company Spacex, Tesla Motors is based in Palo Alto, Calif., and employs about 6,000 people, according to its website. Its cars are built in the San Francisco suburb of Fremont. Tesla said it lost $62 million in the second quarter, when they delivered 7,579 vehicles. The company says it's on track to deliver 35,000 cars by the end of 2014. A Tesla Model S retails for $71,070, according to the Tesla website. Storey County officials say they don't want residential development near the site, a decision that means residents, business owners and local authorities in nearby Reno, Sparks and Fernley will likely be big beneficiaries of the jobs and money brought to town by Tesla. "Our grocery stores are going to do well. Our clothing stores are going to do well," said Reno mayor Bob Cashell. "They're going to live here." Cashell views his town as the last outpost of a megalopolis that begins 220 miles away in San Francisco, and includes Sacramento and Reno. Many residents once lived in the San Francisco Bay Area or in Sacramento, and in its heyday Reno relied on visitors from the most populous U.S. state to gamble in its casinos. But as in Atlantic City and Las Vegas, casinos in Reno declined as gaming became legal in other places, dropping from 25 percent of the economy to about 8 percent, said Mike Kazmierski, president of the Economic Development Authority of Western Nevada. "Our casino gaming industry has stabilized and they are slowly coming out of the recession, but they will not return to the levels they were at years ago when Nevada was the only state where you could gamble legally," Kasmierski said. At dusk on a recent weeknight, Reno's trademark neon sign glowed pink and gold, standing out against the blue-gray sky like a living painting. But few people were out, and several casinos looked as if they could use a paint job. The biggest action was at a new hotel, the Whitney Peak, which has no casino and features a climbing wall where guests can hoist themselves up the side of the building in the neon glow. John Nielsen, 48, felt the decline of gaming here when he lost his job as an engineer with a slot machine company. He hopes there will be a job for him in the new Reno, but with two sons to support and the Tesla plant's opening at least two years away, Nielsen fears any boom will come too late for him. "I see Tesla as being a fantastic employer in the future," said Nielsen, who is considering looking for work in other states. "I don't see it as doing anything for me right now."